You’ve found a map, and as a treasure hunter and all around good guy, you decided to see where it will take you. 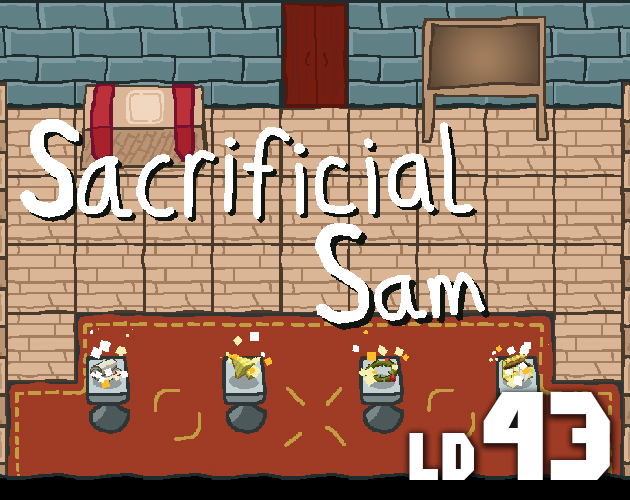 In this brand new game from the minds that brought you a wiggling dragon and a jello filled dungeon, you’ll play as Sam the treasure hunter extraordinaire on his biggest quest yet! 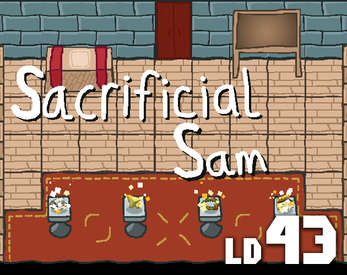 On the way you’ll meet new friends, solve puzzles, find artifacts, and perform satanic rituals. But remember: If it’s treasure you are after, then sacrifices must be made. There are four levels to beat, each introducing new mechanics. Try to figure out what the character you unlock does, and use that to solve the rest of the dungeon. Altars will need one or two things sacrificed to them before they will activate. Once activated they will summon an item/block and/or open a door. Coins are used in sacrificial rituals, and keys can open locked doors. There are also floor buttons that will toggle doors of it’s corisponding color (if any are held down), and levers that do the same. When you unlock a new characters (there are four characters total) you can use the left or right shift key to control them. There are three secret items hidden in the game, if you find them you can get the “good” ending.